Goodbye WTFast Free Account ★ WTFast Is FREE No More - KABALYERO - PLAY, BLOG & EARN! Guys, here is another bad news and it's about my favorite lag killer or ping booster, WTFast. According to an announcement posted in the official WTFast website, all WTFast free accounts will be upgraded to Premium WTFast Advanced version on December 14, 2015 and it will last for 14 days. After 14 days, all free WTFast accounts that were upgraded must subscribe to one of the available payment plans which are WTFast Basic and WTFast Advanced. 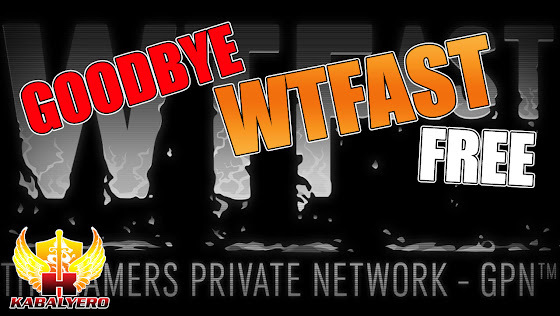 In the announcement, there was no mention of upgraded free WTFast accounts reverting back to just free WTFast accounts which could mean that WTFast is removing it's free WTFast service. As a free WTFast account holder myself, I now have the option to either upgrade to a Premium WTFast account or stop using WTFast forever. So, do any of you guys use WTFast for FREE? If you are then are you guys going to pay and subscribe after the 14 days premium WTFast Advanced period? Post your answers as well as your comments, questions or reactions in the comments section below.